There’s no better way to welcome the fall season than with a batch, or two, of these Pumpkin Cream Cheese Muffins. Deliciously tender and sinfully decadent, a muffin so good that it’ll leave you in awe. A dessert that will keep you in ketosis and improve your heart health? Sign us up. Eggs are an incredible addition to any keto dessert. They have a complete amino acid profile, a whopping 6 grams of protein per egg, and contain lutein and zeaxanthin, which is great for heart health and the prevention of cardiovascular disease [*]. Lutein specifically helps regulate HDLs (high density lipoproteins, aka good cholesterol) and LDLs (low density lipoproteins, aka bad cholesterol). This results in lowering inflammation in the bloodstream [*]. The omega-3 fatty acids found in eggs have also been shown to aid in the reduction of cholesterol, significantly reducing your risk of heart disease and stroke [*]. Pumpkins contain antioxidants called beta-carotene and beta-cryptoxanthin, and alpha-carotene that help neutralize free-radicals and lower oxidative stress. By doing this, it lowers your chances of heart disease and other illnesses [*][*]. They, too, contain lutein and zeaxanthin, like eggs. Almond Flour is packed with vitamin E, a fat-soluble compound that helps prevent cell damage caused by free radicals. This helps reduce the risk of cardiovascular disease [*][*][*]. Not only will this recipe complete your dessert craving it will also give you that extra boost to run a 5k. Not really, but it will definitely give you an energy boost. Eggs are just eggscellent. Not enough good things can be written about eggs. Lutein specifically have been shown to increase productivity and physical activity [*]. On top of that, they are a steady energy source and won’t spike your blood sugar levels. They contain folate, vitamin b12, vitamin b2 (riboflavin) and thiamin which are essential for energy production. Almond flour also contains vitamin b2 (riboflavin) which helps maintain healthy energy levels [*]. Our Perfect Keto MCT Powder Vanilla contain MCTs (or medium-chain triglycerides), hence the name. MCTs are of the purest, most bioavailable sources for energy. They’re a source of fat that creates energy in the form of ketones, almost instantly, which makes them the perfect fuel… basically, they rock. Eggs are rich in choline, which is a macronutrient that our bodies already produce but we mostly need to get it from our food. Consuming foods rich in choline will aide in liver and brain development. The lutein and zeaxanthin that pumpkins and eggs contain are not only great for you heart but also for supporting a healthy brain. One study showed elderly adults who consumed both and resulted in an enhancement of neural efficiency [*]. Lutein and zeaxanthin are more bioavailable when paired with a healthy dose of fat, which is why we’ve added Perfect Keto MCT Powder Vanilla to the mix. Our Perfect Keto MCT Powder Vanilla is a great source of energy but also enhances cognitive function. The MCTs create energy in the form of ketones and ketones are able to pass through the blood-brain barrier and serve as fuel for nervous system. One study conducted showed that by supplementing with MCTs there was an increased of ketones in the blood, which linked to a higher performance in memory scores [*]. Mix the ingredients for the cream cheese filling together and set aside. Combine all the dry ingredients for the muffins in one bowl and the wet ingredients in another bowl. Gently add the wet ingredients to the dry ingredients and mix until well-incorporated. 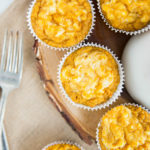 In a lined muffin tin, fill each section about ¾ of the way full and add a dollop of cream cheese on top, using a toothpick to incorporate the cream cheese mixture into the pumpkin muffin mixture. Bake for 18-22 minutes and allow to rest for 5 minutes before serving.